The 500 Watt Solar Panel Kit from Solaroid Energy is ideal for customers who have 3 to 6hrs power supply for their basic home appliances like television, laptops, lighting, fan, and charging of phones. It's an affordable do-it-yourself power inverter kit for homes or offices, that need to power basic home electrical appliances. It includes a 500 VA inverter, 12V battery bank, 7 LED light bulbs and electric cables. If you are looking for a good store for energy, this is your answer. 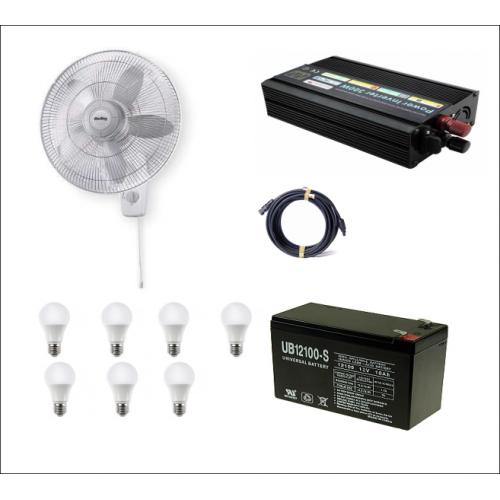 Solaroid Energy cheap inverter kits ensures uninterrupted and reliable power supply. We sell affordable diy home inverter kits and inverter kits for N51, 499.